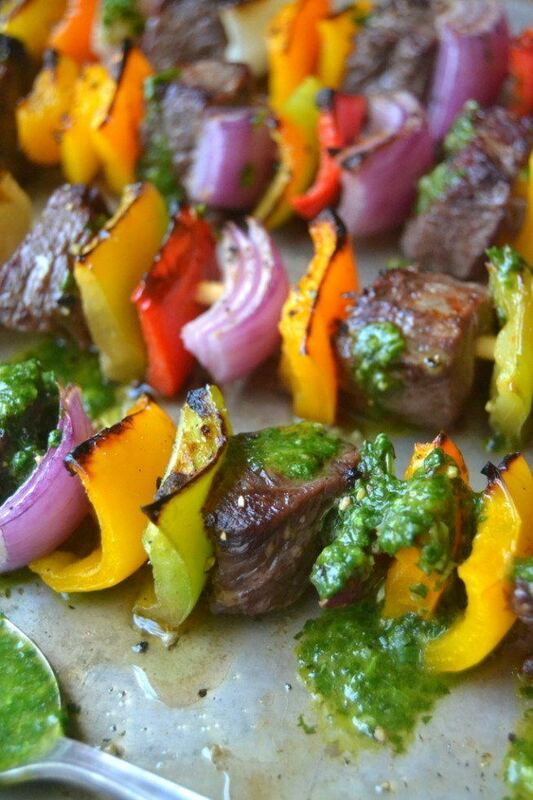 Steak Fajita Skewers with Cilantro Pesto ~ this easy 30 minute meal is a fun way to enjoy fajitas ~ serve them on or off the skewer, with rice, couscous, or tortillas. I sometimes serve them over salad for a gluten free, low carb meal. Trim any fat and cut the steak into bite sized cubes. Cut the peppers and onion into bite sized pieces as well. If you are using wooden skewers, soak them in water for 30 minutes so they will not burn under the broiler. Thread the meat, onions and peppers onto the skewers in any pattern you like. You can stretch out the meat by using more of the veggies. For meat lovers, go heavier on the steak. Lay out the skewers on a baking sheet and brush lightly with olive oil Sprinkle with salt and pepper. Place the pan on the highest position under the broiler and broil on high until the meat and vegetables start to get good color. The time will depend what size you cut your meat. I cut mine truly bite sized, so mine took only 5 minutes. No need to turn the skewers. I like to get a good char on my skewers, but I don't want to over cook the steak, so when the steak is just cooked the way i like it I remove the pan, then put a muffin tin on the oven rack, and place the skewer pan on top of that. This gets the skewers right up next to the broiler flame and will finish off the skewers with perfect charring. This will take less than a minute, watch it carefully. Serve on or off the skewer, with rice, couscous, or tortillas. Drizzle with lots of cilantro pesto. To make the pesto: Fill the bowl of a small food processor with the cilantro, and pulse until reduced in bulk, scraping down the sides. Add the lemon juice and a splash of oil, and process until pureed. Add the salt and pepper to taste.